My eldest son and I with the help of friends and family built this cathedral, post and beam home in 2008 to share the beauty and tranquility of Horseshoe Lake with those seeking a similar experience. I am a life long resident of WNY. I can tell you about the happenings, beauty and enjoyment found across New York as my work and life has taken me to every area of this incredible state. I own this home on Horseshoe Lake because it truly a WONDER. Please take the time to share what I have found here. This is where I spend much of my time as it is my retreat from the rush of the cities. Guests have full use of the house and all of its amenities. I stay at other property during your stay. 30 miles from the center of Rochester but feels like you are in the peaceful environment of rural America. Relax and enjoy the world around you. 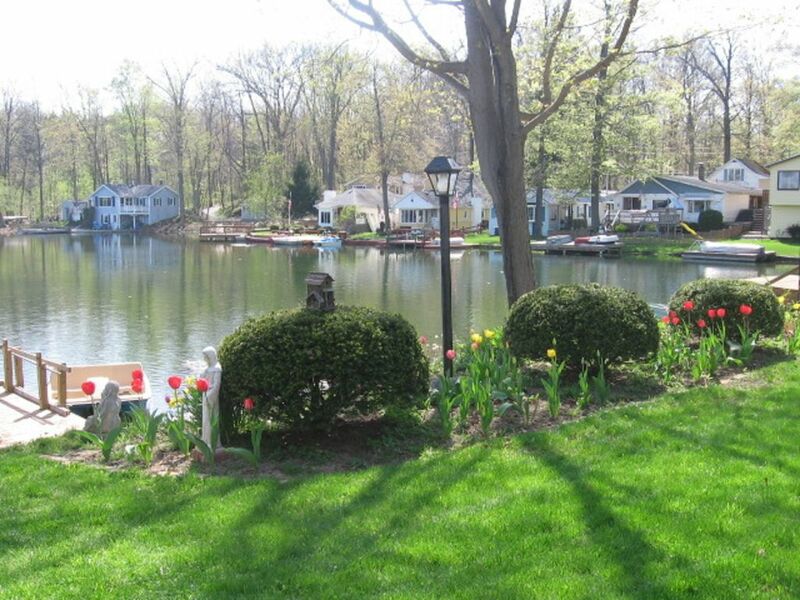 Set on the front deck or large boat/swim dock overlooking tree lined lake. Wonderful! This 'Little Piece of Heaven' is truly that. Everything we could possibly need was provided. Ed Anna was an excellent host and very responsive to all of our questions. This home is very clean and comfortable with easy access to the lake. If we only knew tranquility was so close to home. Being a bit off season, the lake was very quiet and still. The morning steam across the water was an extra delight. Just what we needed. The Lake House was so much more than we anticipated. Very warm, clean, spacious, welcoming and comfortable; not to mention the view that made it easy to stare out across the water for hours. We truly felt a bit of the Adirondacks around us. Caught I nice Northern Pike to brag about too! We can't thank Ed enough for his hospitality in inviting us to use what is his. It was a beautiful weekend. We enjoyed a week of relaxed filled days at this property on Horseshoe Lake Road in Batavia, NY. It was comfortable, a pretty view of and access to the Lake and well equipped for all our needs. I am concerned about writing a good review because price might go up or the availability go down. OUTSTANDING ... I could not say enough about this place. We do a bunch of travel this way and typically the posting is better or equal to the place, this time Ed understates his "piece of heaven"! I love to cook and this place was VERY well equipped. Not the biggest kitchen but the pots and pans were GREAT, often this is NOT the case. Two golf courses, mini golf, great dinning, Batavia Raceway and Casino. Batavia City Center 3 miles, Movie Theater,. Aldi Grocery Store, fast food, local diners. Bike country roads. Private life guarded beach.